The satsuma mandarin orange--a tangerine which originated in Japan--arrived in the United States as experimental planting stock in 1878. Well adapted to the subtropical regions of Japan, the satsuma orange grows in regions of the United States too cold for other citrus fruits. 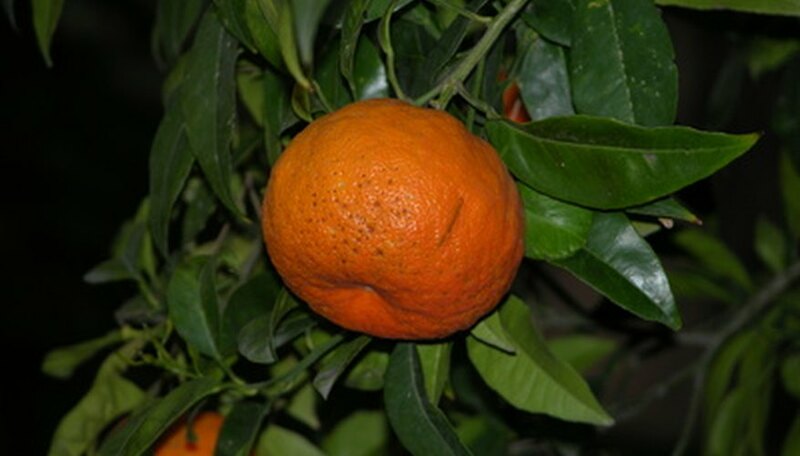 When grafted to cold-hardy trifoliate orange--a thorny shrub with bitter fruit--the satsuma survives winter minimums of 15 to 18 degrees F. Because satsuma oranges do not produce well in the hottest climates, commercial growers limit production to the northern part of subtropical America. Outside that narrow band, home growers could still see regular crops from this hardy citrus tree. Chip-graft satsuma orange scions to trifioliate orange rootstock in spring. In southern growing regions bud grafting succeeds best from February to May. Collect healthy green twigs of satsuma orange as scion material. Make a horizontal cut on the trifoliate rootstock 8 to 12 inches above ground level. Cut straight across one side of the stem through the bark and cambium layer to the sapwood. The cut should be no longer than one-third the diameter of the stem. Make a vertical cut downward from the starting cut. Cut through both layers of bark and make the cut 1 inch long. Use the point of the knife to gently pry the corners of this T-shaped cut away from the sapwood. Select a satsuma orange bud from last year's wood. Choose buds just below the first new wood of the season in order to use the most vigorous scion material. Slice through bark and wood under the satsuma bud, starting 1/2 inch below the scion bud and ending an inch above the bud. Cut the chip free of the twig with a straight cut across the twig at the upper end. Slip the bud under the bark, fitting the straight top of the shield-shaped chip against the horizontal part of the T-shaped bark notch. Wrap the graft above and below the bud with grafting tape, rubber bands or electrical tape. Cover all edges of the wound. Remove the wrapping when the bud graft heals--about 3 to 4 weeks in the spring. Cut through the wrapping carefully on the opposite side of the stem from the grafted bud. Prune the top of the rootstock back to between 12 and 14 inches above the graft after the graft completely heals. Don't clip off leaves or shoots on this short section of nursery branch until the grafted bud grows several leaves of its own. Cut the nursery branch off 1/8 inch above the graft when the new scion shoot shows vigorous growth. Use only trifoliate orange rootstock. Sour orange--another common rootstock--stunts scions of satsuma. Graft to rootstocks or branches of 1/2 inch to 1 inch diameter. Where Satsuma orange trees could be killed back by winter cold snaps, cover the rootstock and graft junction with mounded soil in late fall. If cold weather kills the orange tree back to ground level, both scion and rootstock should survive.